Several years ago I ran across a unique item at Good Will. for years I used it horizontally in my workshop, not really knowing what to do with it. See it there sitting on top of the dog crate? recently I've cleaned it up, brought it inside and it works great in my creative space. I use it to store paper items I use in my projects. And it's narrow enough for the limited space I have in there. It's been awhile since I've posted any of my finds, but I've been finding some great stuff. I'd love to keep it all, but I can't, so I'm happy to make it available to you. All of these items can be found right now at Winnie & Tulula's in Athens. 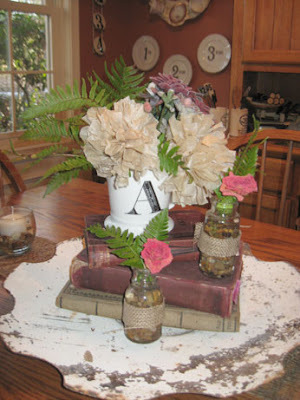 Made from Vintage Readers Digest Covers, with sturdy card stock pages. They were a great seller in December and you can get them now at a discount. 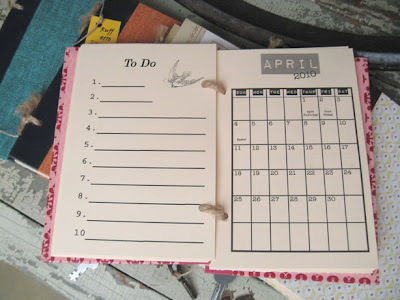 Project, and idea pages, 2010 Calendar and a place for notes. Also extra pages for Christmas lists and A Key, place keeper. Email Me if you are interested and note the color or cover design of the book you are interested in. Only the ones in the pictures above are available at this time. Right now 1/2 price at $6.00 ea plus First Class shipping of 4.00 for 1 book, or media mail of 2.50 (to US addresses). She has 2 days to contact me and if I don't hear from her I'll draw again. Thanks to all who entered, and who are registered as followers. 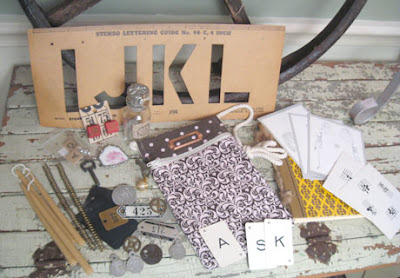 When Flea Market Style magazine comes out, I'll have another give away, so watch for it. Thanks to everyone who entered, Wish I could give you all something. In Honor of going over the magic number of 200 followers I'm having a give away. 1) Be a follower, everyone already a follower is automatically entered once. Button has been added to my side bar, feel free to grab it. You must tell me in your post that you are mentioning it in your blog to be entered for that. So your name can be in the pot up to 3 times via each of the methods above. One lucky blog reader will win this great grab bag of Robo Junker stuff. Remember you can be entered up to 3 times, in the ways described above. Give away delay-due to FIRE!!!! OK, So I'm setting up my photography area to snap a pic of my give away items. I have these fancy light kits with umbrellas on them, that belong to my hubby, that I use for taking pics. I decide I only need the one, but when I turn on the power strip they both come on. I leave one umbrella folded, and just use the other one. I turn my back to get something out of the closet and I start to smell something burning. As I turn to see where the smell is coming from I see one of the light umbrellas in flames!!!!!! I yell, "Fire, Fire Extinguisher" repeatedly , as I run down the hall trying to remember where it is, as my husband runs in puzzled. Of course he runs for the extinguisher and I'm right behind him. He gets the fire out toot sweet, it took about a minute for the umbrella to catch fire, and about 30 seconds for us to put it out. It all happened so fast, I'm feeling very stupid, and I'm left with this. Now something you must know is that when you use a Fire Extinguisher, the stuff inside gets on everything. So now there is a layer of powder on everything in my guest bedroom, including the give away items. So give away delayed for at least a day while I clean up the mess, and assess the damage. Right now it does not look like there is any fire or smoke damage to the house, just the light kit. And lots and lots of dust. It smells awful in there!!!!! Oh the drama never ends!!!!! As you may or may not know, my Son is getting married in June. I was thrilled when he asked me to help him with the centerpiece arrangements for their reception. He had a picture in his mind from this photographers web site. I knew exactly where to find the mugs, and I have lots of old books, so we began to brainstorm some of the other details. I ordered the mugs last week, and they arrived today. I couldn't wait to get started playing . Above is the arrangement he likes best. The ribbon will be different, and of course the flowers will be different. I'm just arranging the Junk. I liked it so much I added a more junk to it, and for now it's my centerpiece on my table. I can't wait to see it on the ivory table cloths, with a pretty satin ribbon underneath. Beautiful roses flowing out of those containers. It will be beautiful. I'm so glad they are including me in on this. I'm getting ready for a give away so keep watching. I hope to get it up for the weekend. Looks like retailers are starting to "get it" check out this article excerpt from today's Minneapolis Star Tribune. Coming soon to a Bachman's near you: the junk aesthetic. The retailer confirmed it has hired Junk Revolution entrepreneur Ki Nassauer (www.junk revolution.com) to advise, locate and help develop lines of repurposed and new vintage decor, gift and garden items for its six floral, gift and garden centers. The concept, expected to roll out by the last weekend in March, starts with the flagship Minneapolis store and garden centers in Plymouth and Eden Prairie; it's slated to be in the Maplewood, Apple Valley and Fridley stores by the end of July. Just to clarify, They are using REAL JUNK. 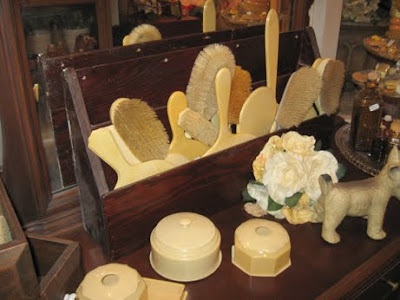 Right now the buyer is combing the country looking for those wonderful stashes of great stuff. Way to go Ki!!!!! Show em how it's done. 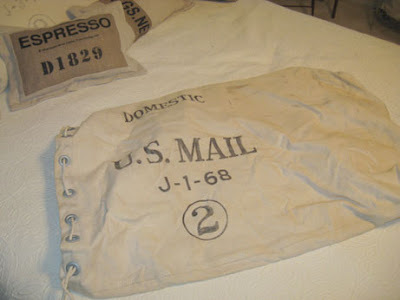 If you are ever lucky enough to find US mail canvas bags in good condition at a reasonable price, be sure to scoop them up. I was lucky enough yesterday to get 2 of these wonderful bags. I knew immediately I wanted to turn them into pillows/ or cushions. First I washed them, I think one still needs a good soak in Vintage Textile Soak. I wanted to do these cushions/pillows without cutting the bags up or destroying them in any way. So I took the smaller one, stuffed it with 2 standard pillows. Tied the end grommets with jute. Kept the original industrial lacing mechanism in tact, and that is it. I now have a unique pillow for the guest room. I think the other will be for my swing outside. And when I'm tired of them, I can sell them in their original condition. I just wanted to say a quick thank you for all the comments left regarding Michelle's passing. To me she was a friend of a friend, and our children did some things together. Unfortunately I never got to know her real well. Her family, I'm sure, has comfort in your comments as well as knowing that she is with her Father waiting patiently for them. Again, thank you for your caring comments, support, prayers and concern. I don't want to bring the blog down, so I'm going to show some more of the burlap pillows I've been working on. These and other items are available on my Etsy account. I'm trying out Etsy for awhile as I'm sick of Ebay. Only one day left for the Winnie & Tulula's White Sale. 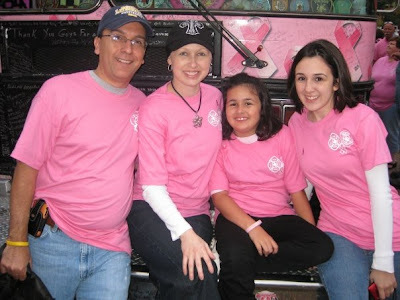 If you've been reading my blog over the past months you've heard me mention my friend Michelle T. Unfortunately she lost her battle with Cancer on Jan 14, 2010. Below are the comments left by her husband on Michelle's facebook page. "Dear friends, my dear wife and soulmate past away early this afternoon. We have been so moved by your warm remarks and prayers. Michelle was a very special person to me and my family but also to all who knew her. We rejoice in her walking with Christ but it is our humanity that causes us to mourn the separation. The last words I said to her were "See you Later" because I will see her again someday. She is walking with our Lord Jesus Christ and will no longer know the wrath of disease and the other bad things this world has. Heaven has gained a shining star today. Please continue your prayers for our family as we try to adjust to a new life. We ask you to give God the Glory, his ways are a mystery to us sometimes but His way is always right no matter how much it may hurt. Michelle leaves behind a new cancer ministry at our church which will be off and running this month. While I hate no person, this disease called cancer has gained a bitter enemy. I will do whatever I can to carry on the fight using God's love as a sword. We will be posting funeral plans when they become finalized. Once again bless you all for all the prayers. We love you all and please give the ones you love a hug for us today. God is Good!" It's been so cold outside this past week, that I've been busy doing indoor projects. Roger and I took on the challenge of trying to piece it back together. Not all of it was there. So I tucked it away under the bed, until last week. What do you think? I don't know where I'm gonna put it yet, I may just leave it there leaning against the wall. There are lots of tiny tiny pieces around the "6". 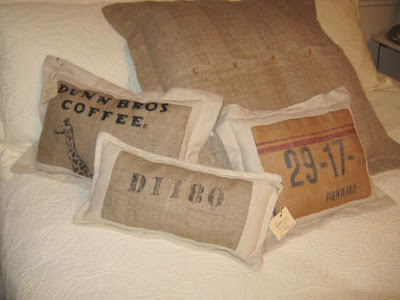 I also decided to try and make some pillows out of some coffee sacks I'd accumulated. Now the sewing machine and I don't get along too well, so there is a lot of blood sweat and tears in these little pillows. I think I've got it figured out now and I may make some more. I finally got my couch slipcovered. This sofa is a sleeper and is in my creative space room. It's very convenient if we have extra guests, but it's ugly. I decided to buy a slip cover for it, but I didn't like the way it looked (still looked like a sheet draped over a sofea). So I added aChenille bedspread and some pillows. I love it now. It's warming up outside so I was able to unload my trailer, and straiten up a little out in the barn. Yippee!!!! 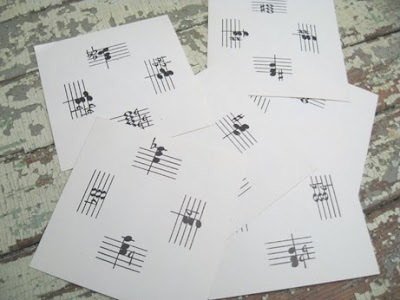 I have a large batch of these musical flash cards. One side is as seen above and the other has the corresponding musical terms ie: "F Minor" etc. Each card is on card stock and measures 4x4 inches. They are all in very good shape and are genuine, not reproduced. Great for Scrapbooks, Decor, Christmas, anything you'd like. Some sets have recognizable bones like the skull, and full body, hands etc. Some are less recognizable. If you have any preferences please let me know. I prefer Paypal, but will accept money orders. I just collect 6.75% sales tax for Texas Addresses, Please include your zip code when you inquire. I wanted to take a minute to let you know about 2 new bloggers. Each of these gals is not new to the junking world, just the blogging world. She's finally taking the plunge into Blog land and I'm so happy to see her here. 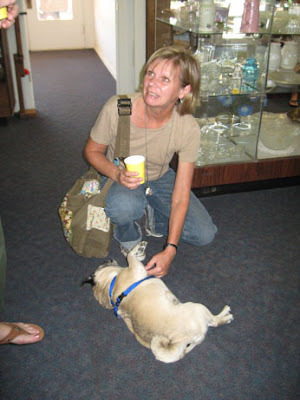 "I will be blogging about Belton and writing about every single antique store in town. Jane has occasional sales in Minnesota and is a regular vendor at the Junk Bonanza in September. Not only is she a vendor, she is responsible for recruiting all of the vendors so she knows what she's doing. 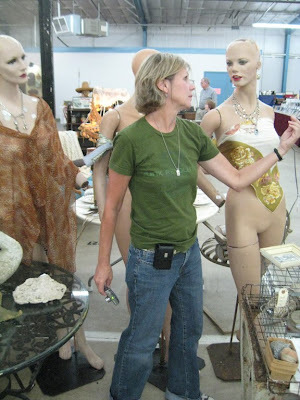 The pic below was taken in her booth at the last Junk Bonanza, she is second from the right next to me. both of these ladies are great fun in person, and i"m sure their blogs will be just as fun and informative. They have talent, and I can't wait to see what pictures, ideas, and fun they will be sharing. pop over, tell them hello, and be sure to mention that I sent you. The Excitement is building as the day approaches for Flea Market Style magazine to hit the stand. Last May I was able to take Ki on a tour of a local flea market, and it was the first feature assigned for the magazine. I've been tempering my excitement ever since. I've seen the photo's, I've read the article and I've been teased with other articles and news from the magazine. Right now the FMS blog has a great post with more teasers about the upcoming release, and yes even some pics. Pop over there and give it a look, I can't wait. Starting Feb 23 you'll see this great new magazine on news stands. And maybe a surprise or two as well ;). If this is how 2010 starts I can't wait for the year to get in full swing Woo Hoo!! Below is part of an article I wrote for the FMS Blog about my experiences shopping with Ki-it was such fun. Since we are sharing behind-the-scenes stories, I thought I’d share mine about what it is like to shop with Ki Nassauer. Now, I must start out by saying that this is a dream of mine. I’d been reading Ki’s column in Country Home for many, many years. I was one of the first members of the American Junk Club, and am an all-around Ki “wannabe”. Out of the blue a few years ago, I emailed her and suggested that she come to shop at a local flea market near my town. After getting to know Ki over the last year, she finally took me up on my offer. Well, it just so happened that our jaunt to the flea market was scheduled at the exact same time that Flea Market Style was given the green light. So, our little shopping trip turned into a full feature for the magazine (insert happy dance here). My son happens to be a photographer, so we dragged him along on our little trip to photo document it all for the magazine. Yep, I’m just a little bit proud! 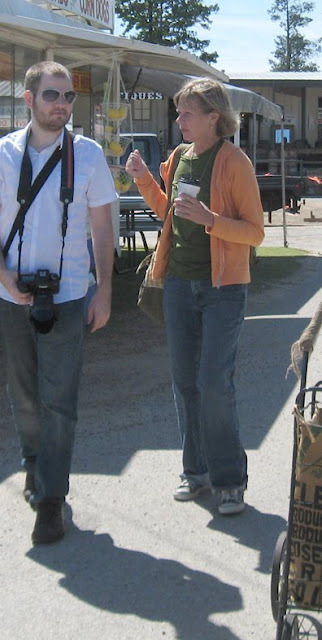 The first thing you need to know about Ki is that she NEEDS her coffee, and is rarely seen without a coffee cup in her hands. Ki also loves dogs, and any puppy in her path required a stop - to rub bellies, ears, and talk a little baby talk before shopping could continue. Back to shopping: Ki is a pro; she knows what she wants pictures of, knows how she wants it to look, and that is her focus. 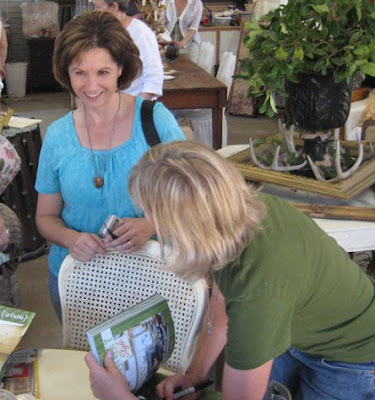 But she also loves to visit with the vendors - which is necessary when you are writing a story about a flea market and its vendors. I, on the other hand, am a power shopper! I am used to covering lots of ground in the shortest amount of time, with my sights on the finish line. No stopping to smell the roses for me! But knowing that I was a tour guide, I toned it down and let Ki set the pace. Good thing too... but there was so much ground we didn’t even get to cover! So we shopped, visited, partied, ate, and took lots of pictures which you will see when the magazine comes out. 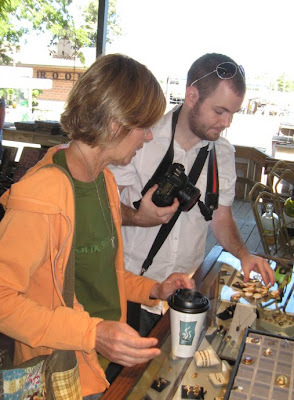 I think you’ll be very impressed with the beautiful shots and wonderful junk we found, and with the vendors we got to know.